If we do not think winter gardens are very interesting, we need to change our view. We can choose trees and shrubs that will create winter interest. We can add color and texture and create an engaging view from our window. When we planned our new Greenfield garden, I was thinking about low maintenance, plants for pollinators, and tolerance for spring floods. It was by pure luck that I now see some of those plants double their appeal by providing winter interest through color and texture. 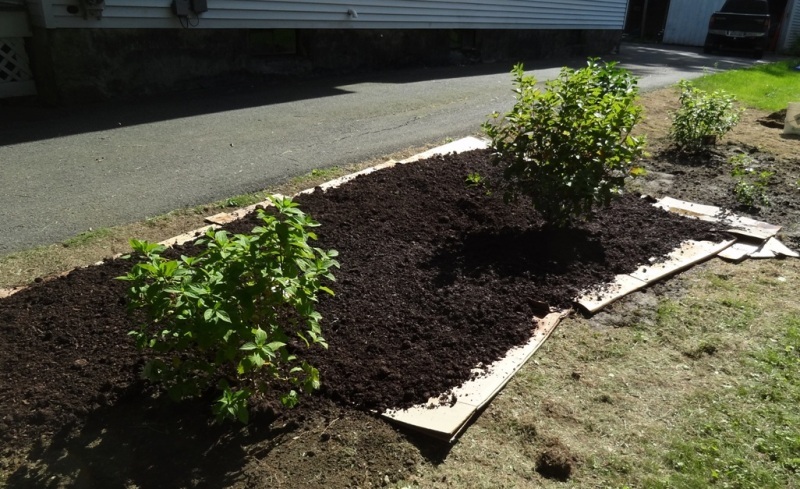 To begin, I have three dogwood shrub cultivars. These shrubs are very tolerant of the cold and of periods of flooding. 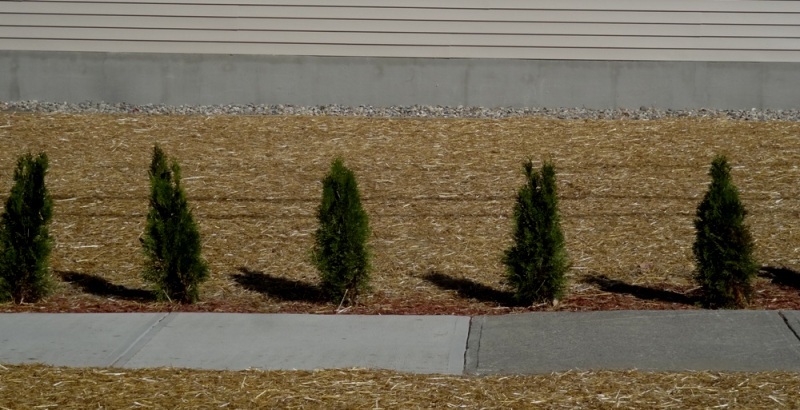 They are sometimes suggested for rain gardens. I think my osier dogwood may be Cornus sanguinea ‘Winter Flame’ because it matches a catalog description. It is quite tall, about 8 feet, with twigs in surprising shades of orange, yellow and red. I also have the more familiar red twig dogwood. a deep wine red, but I have lost the name of this particular cultivar. 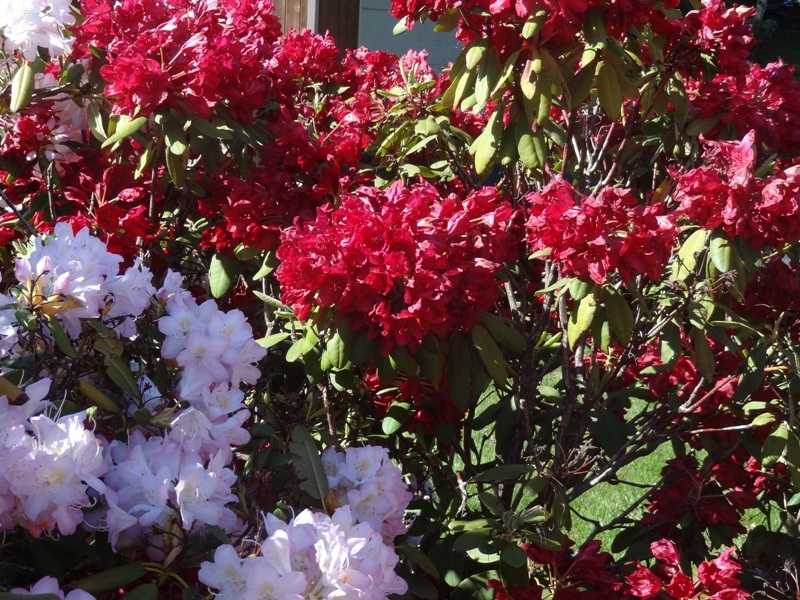 Other cultivars like Arctic Fire and Siberica are brighter, clearer reds. I do know that my yellow twig dogwood is named Flaviramea and sings out its bright color in the winter sun. Flaviramea has particularly pleased me, sited as it is in the middle of the garden where I can see it from my kitchen windows. The golden green glow in the sun is cheering. I do have to prune it to keep low branches from rooting in the soil and sending out new plants. In my wet garden this is a vigorous and happy plant. All the dogwoods have small flowers in the spring and white berries in late summer. Equally happy in my wet garden are the winterberries. The winterberry, Ilex verticillata, is a native holly. I have two red winterberry shrubs, and one with golden berries. These are not only bright and pretty, birds like the berries. It is important to remember that winterberries are dioecious. This means the male and female flowers are on separate plants. To get berries I need to have female and male plants. The male plant is virile, pollinating up to ten nearby female plants, but it is smaller and less showy. I also have two healthy English hollies, Ilex aquifolium, in front of the house, a male and a larger female loaded with berries. They came with the house so I don’t know their cultivar names, but some of these English holly hybrids come with names like Blue Princess and Blue Prince. I enjoy pruning the berry laden branches for Christmas decorations in the house. If I had room I would love to have a hawthorn tree, Crateagus, which will grow to about 25 to 35 feet with an equal spread. Crateagus viridis is a native hawthorn with showy white flowers in the spring and red fruits called pomes in the fall and winter. Unlike many other hawthorns, C. viridis Winter King does not have large sharp spines, making them easier to prune and care for. 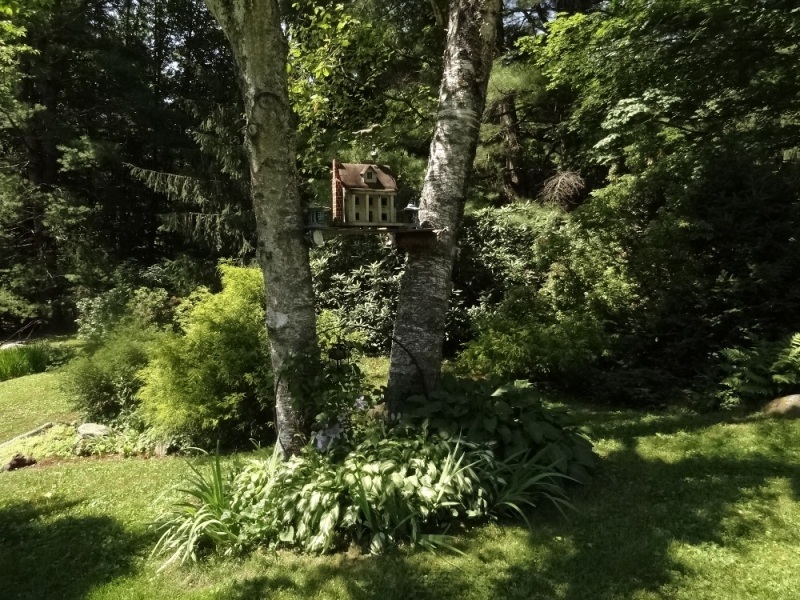 This tree will attract butterflies in the spring and summer, and birds in the fall and winter. I think birds are an important element of winter interest. You can see six berried hawthorns at the Energy Park. Flowering crabapples are a delightful sight in the spring and there are dozens of cultivars. Sugar Tyme is a good size for a small garden, reaching a height of about 18 feet with a 15 foot spread. It is highly disease resistant and has pale pink buds that open to white flowers. Its benefit to the winter garden is that it holds its little red crabapples well through the winter. Other small crabapples include Donald Wyman and Callaway which both have white spring blossoms. Adams has double pink blossoms. All have been praised for their hardiness and disease resistance, by horticulturists like Michael Dirr. They are decorative, and provide food for wintering birds. I must point out that crabapples are not as amenable to flooding as the winterberries and river birches. Tree bark, as well as berries can provide winter interest. We have planted two clumps of river birch, Betula nigra, which will grow to about 40 feet tall. 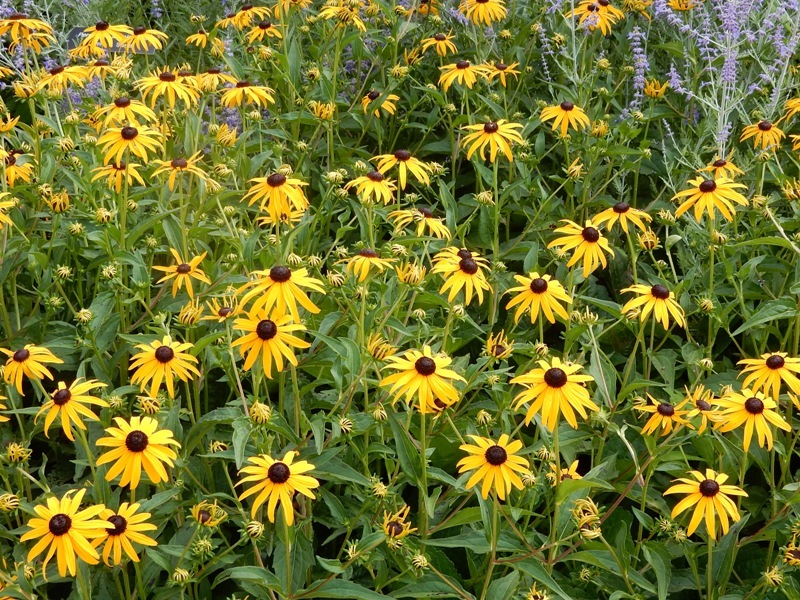 They are known to thrive in wet, heavy clay soils, and don’t mind flooding which makes them perfect rain garden plants. There are flowers and catkins in the spring, but we planted them because of their beautiful exfoliating bark. It is the texture and pale color of the bark that appeals to me. Another tree noted for its exfoliating bark is the paperbark maple, Acer griseum. The foliage gives good red fall color in the northeast but it is the color and shagginess of its reddish-brown exfoliating bark that is stunning in the snowy landscape. The bark ranges in color from a rich coppery shade to darker cinnamon that peels away in large curls that remain on the tree. I saw a number of these trees planted in the beautiful Monk’s Garden at the Isabella Stewart Museum in Boston. They are small upright trees that will reach a height of 20 to 30 feet. The sun is shining today, and the air is mild but snow will come and I will find loveliness in my garden. As long ago as 1945 I had an opinion about hydrangeas. In 1945 I was five years old and living with my parents, and my two younger brothers, in the Bronx. When the weekend weather was fine my parents often took all of us on a stroll through the neighborhood. We lived in an apartment building surrounded by cement, but there were many houses on our street that had tiny front yards that often showed off one or two hydrangeas with fat balls of blue flowers. I took against those blue hydrangea blossoms, but I can give you no reason for my dislike. I don’t recall many occasions when hydrangeas played any part in my life after that until 1971 when I moved to Greenfield. Three straggly white hydrangeas held up their weary heads in front of my new front porch. I immediately pulled them out. In subsequent wanderings, to Maine and Manhattan I began to feel more friendly towards hydrangeas. There was no more reason for my growing affection than there had been for my disaffection. 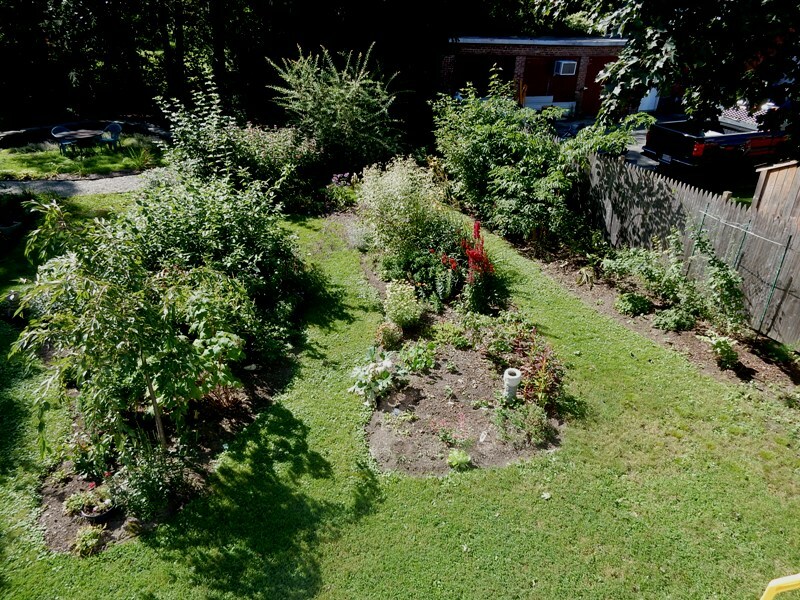 We moved to Heath in 1979 and I began to plant gardens. Most of my attention and energy went to vegetables and what was to become our Rose Walk. Not a hydrangea in site. Years passed. One day, I was looking at the plants at a small nursery (soon to be the New England Wildflower Nasami Farm) in Whately owned by Bob and Nancy August. Mrs. August was minding the plants that day. I wandered and kept coming back to a small young hydrangea with airy white blossoms named Mothlight. These blossoms were nothing like heavy mopheads. I considered it for quite a long time, and finally decided to buy. As Mrs. August and I were chatting, she commented on my odd limping gait and suggested that I do something about my hip. That was a bit of a wake up call. And I did do something about my hip. I got a new one. She made me realize I didn’t really have to hobble about any more. I was grateful to her for her advice and for the Mothlight. The Mothlight hydrangea grew very large in Heath which surprised me, but the white blossoms retained their delicate airy-ness. I later added a Limelight hydrangea which has pale chartreuse blossoms, and Pinky Winky which begins white and turns pink over the season. I also planted the white flowered native oak leaf hydrangea. 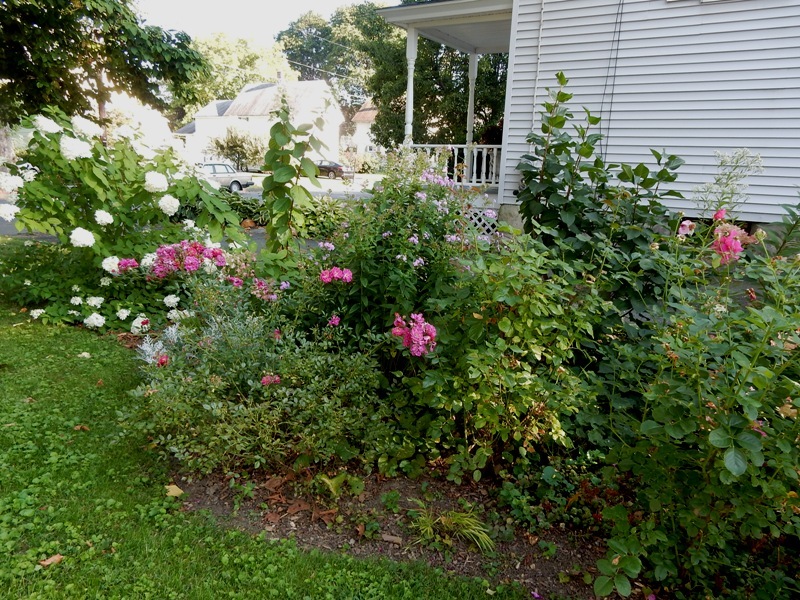 It was my intention to have these three large shrubs form a kind of long flowering hedge at the eastern edge of my lawn. There it got morning shade and plenty of sun the rest of the day. When we left Heath I realized that hydrangeas would be perfect for the low maintenance garden I was planning in Greenfield. The land next to my neighbor’s driveway is about the driest spot on our property. Hydrangeas, like roses, do not like ‘wet feet.’ I chose Limelight once again, and I also chose Angel’s Blush which is white but becomes rosy in the fall. Firelight was my final choice which becomes a dark pinky-red in the fall. 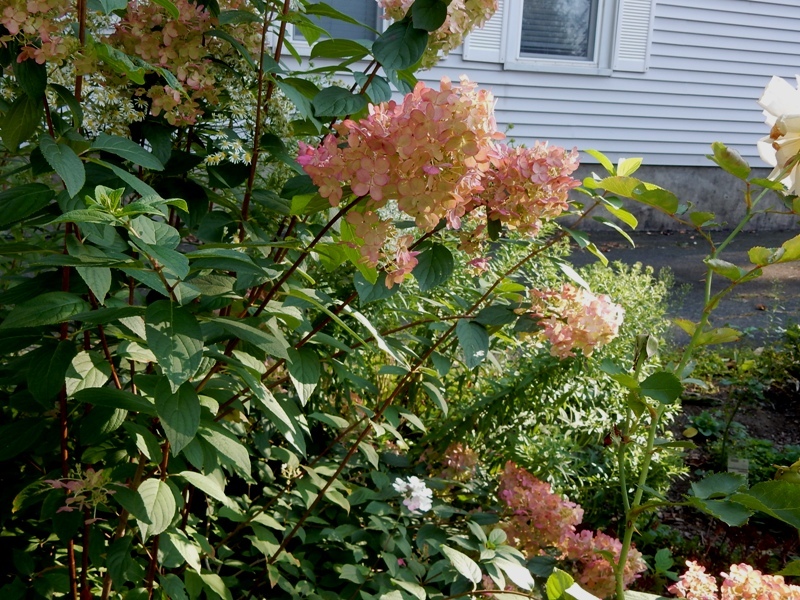 Except for the native oak leaf hydrangea, all the hydrangeas I’ve ever planted are paniculatas. This was really by chance, but I chose them because they are hardy and very dependable. They can all become quite tall and have conical flowers. Paniculatas and H. arborescens like Annabelle bloom on new wood, which means they should be pruned in the late winter or very early spring. 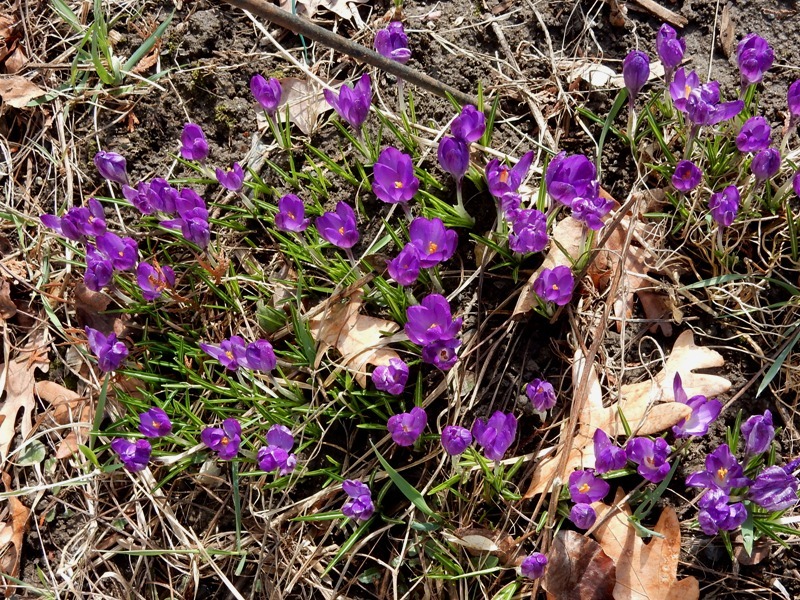 Since they bloom on new wood, it won’t matter to them if the winter has been harsh causing winterkill. Prune them back and the new growth will provide new flowers. Annabelle has been a popular hydrangea. It is native to North America and very dependable. 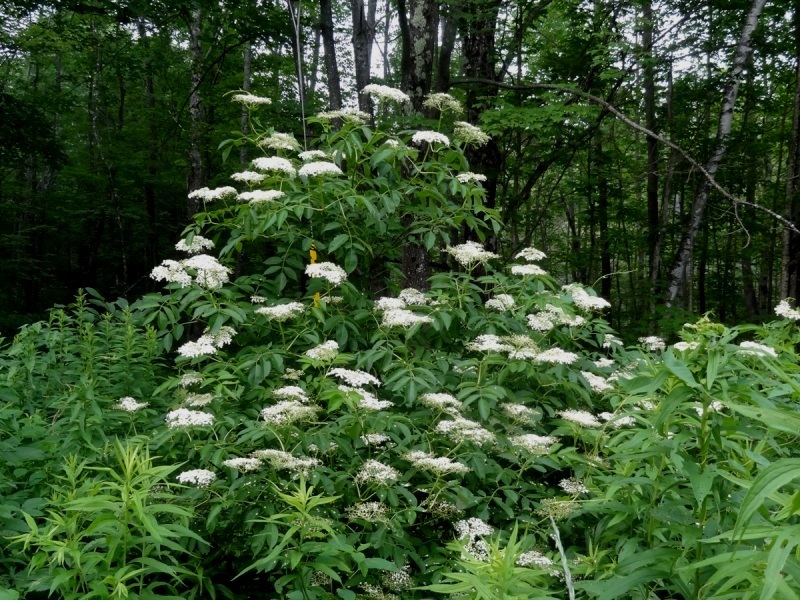 It will grow about three to five feet tall with a similar spread and the large white flowers resemble mopheads. When one of my young relatives married in August a few years ago the wedding was held at an estate where ranks of Annabelles blossomed on a severely terraced hill. Interspersed with the hydrangeas were clumps of airy white obedient plant. It was an elegant arrangement, and certainly perfect for a wedding celebration. The big blue hydrangea blossoms I found so distasteful in my childhood were mopheads. Perhaps I intuitively knew that they were trouble. Hydrangea macrophylla blooms on old wood which means if there is a bad winter the buds will be killed and there will be no bloom. They can then be pruned but there will be no flowers for another year when the new growth counts as old wood. If there is winterkill there is no help except pruning out deadwood and cultivating patience. For regular maintenance you can prune out a few branches each year which will encourage a steady renewal. I love H. quercifolia, the climbing hydrangea. They can climb trees, or walls and are beautiful and really stunning. They take a while to get going, but the patience it takes is worth it. All hydrangeas like sun but can take some shade. They need regular watering, but definitely do not like waterlogged soil. There is a hydrangea for every garden, in every color and size, including small varieties that can be grown in a container. What’s your pleasure? A shrub with golden blossoms, a witch hazel, is blooming our our street. Some thought it was a forsythia that got it’s dates mixed up, but it is witch hazel, properly known as a Hamamelis, and about the earliest blooming plant in our area. You have to get up close to appreciate and admire the twirly little blossoms. This is probably Hamamelis mollis, a Chinese witch hazel, because it is blooming in the spring, beginning in February. Our neighborhood witch hazel has been blooming for about a month, enduring several snowstorms and frigid weather. Arnold’s Promise, the golden spring blooming witch hazel, is one of the most popular with gardeners. It usually grows no more than 12 feet tall with a generous spread. Diane, with its red twirly blossoms is another popular spring bloomer. Hamamelis virginiana, our native witch hazel, blooms late in the fall. I have to say that I find Hamamelis mollis so encouraging when it bloom in the spring. Witch hazel is a plant that some of us may not recognize in a garden, but it is quite likely that we have a bottle of witch hazel in our medicine cabinets. It has been used for centuries to soothe various skin problems like poison ivy and hemorrhoids. A witch hazel branch is also used by dowsers searching for water – or anything else. Experienced dowsers say you can dowse with anything and many of them travel with a dowsing pendulum. Helen, a dowsing friend told us we could dowse with a needle as pendulum hanging on a thread. While living in Maine we successfully needle dowsed to find the underground pipes in our new house when there was a plumbing problem. We also asked the dowsing spirit where we should move in Maine to find our heart’s delight. It gave us a town midway up the coast, but in the end we moved to New York City. We found our heart’s delight there, too. 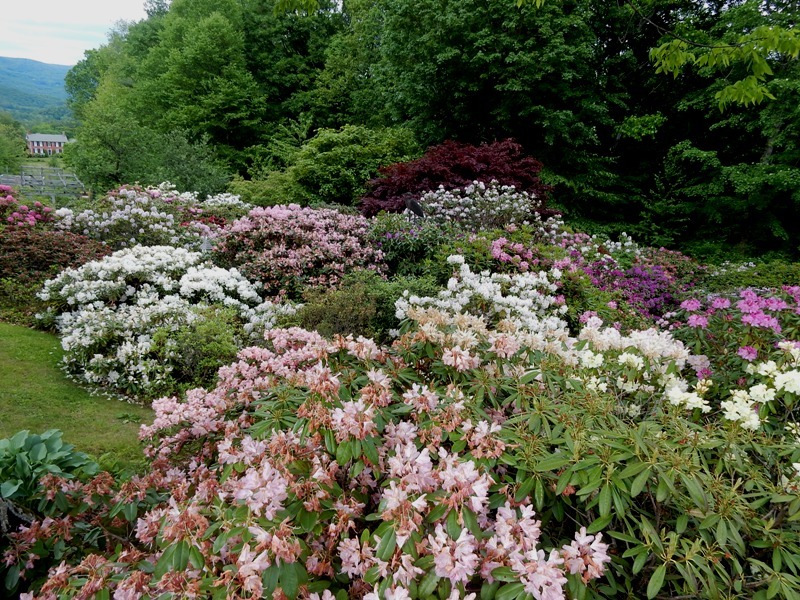 Our hugel was built to help us manage water, but also to provide a stage for rhododendrons. 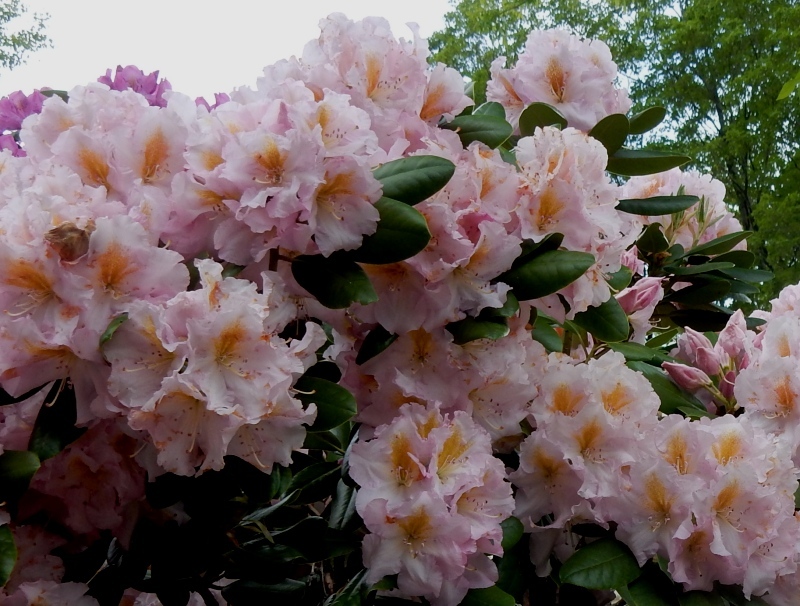 This past weekend my friendly rhododendron specialists took me shopping at the Windy Hill Nursery in Great Barrington. We bought three cultivars: Janet Blair a beautiful pale pink with a golden flare in the center, Wojnar’s Purple and Francesca, a red. 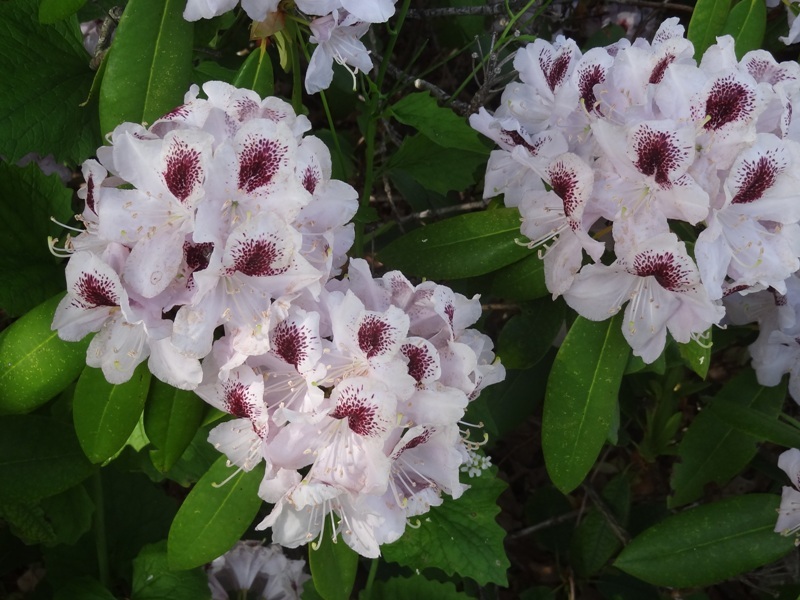 The photos of Janet Blair and Wojner’s purple were taken in Jerry Sternstein’s rhododendron woodland which includes nearly 400 other rhodies. These shrubs will mature at about 12-15 feet tall and equally wide. Francesca is a real red rhodie and this photo was taken in John Valigorski’s garden. My garden will never hold hundreds of rhodies, and I am already feeling a little rhodie jealousy. 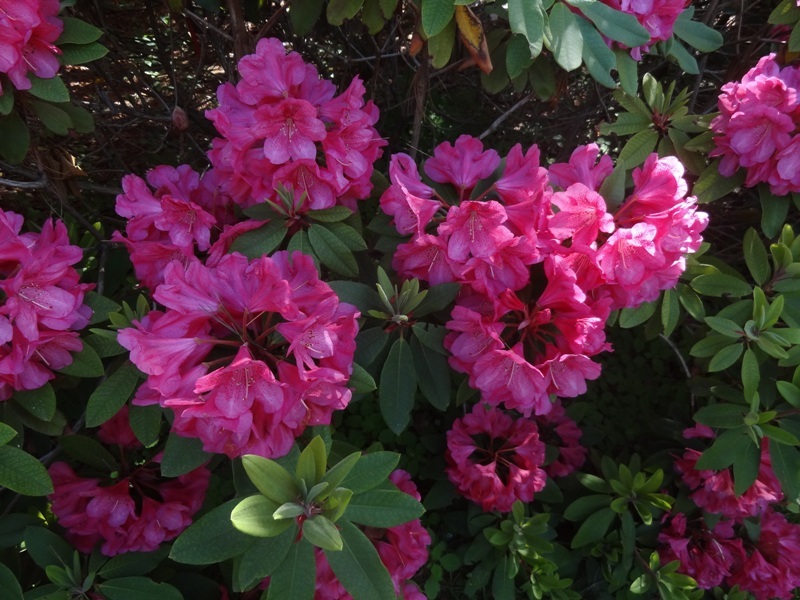 Here are more rhodie photos. 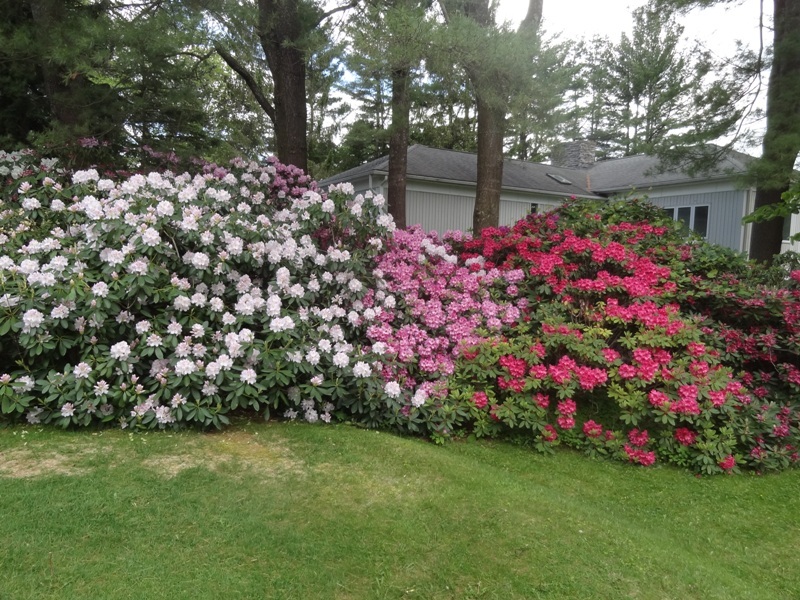 John Valigorsky’s rhodies edge his front yard, and then travel through the back yard, at one point creating a rhododendron woodland. Jerry and John have very different sites. Jerry’s garden blooms in full sun, enjoying the naturally acidic soil. 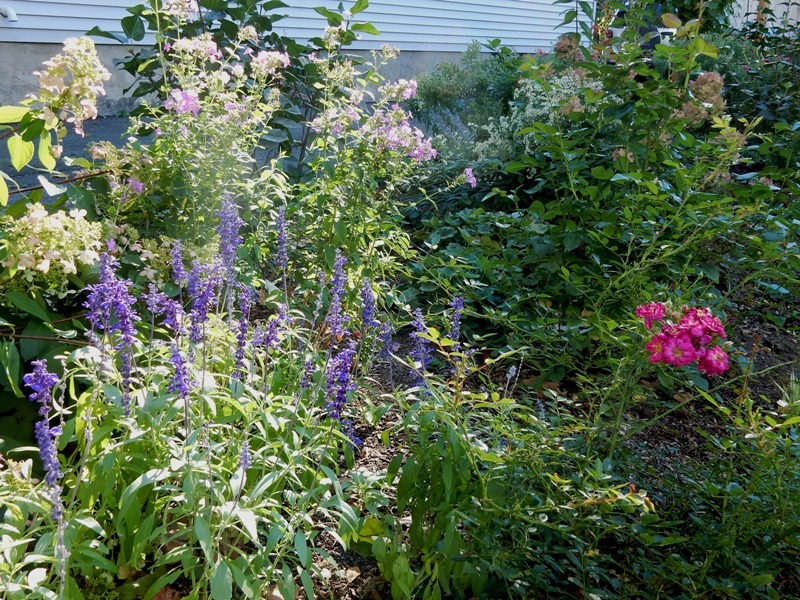 John’s garden enjoys some shade but blooms in defiance of the alkaline soil. There are fertilizers like Holly-Tone that help acidify soil. 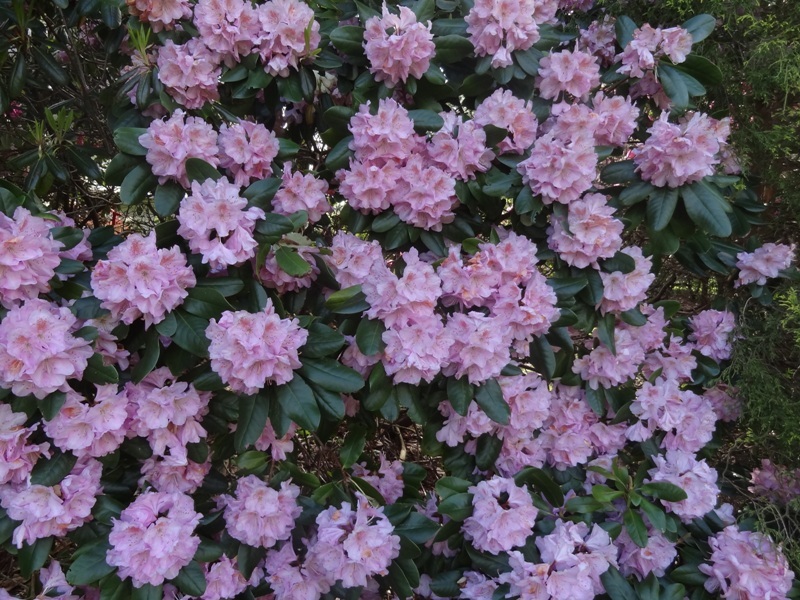 Both men say the important thing in planting a rhododendron is to remember the motto “Keep it simple, just a dimple.” No $5 holes for these rhodies. All they need is a slight depression in the soil, with soil then being brought up around but not touching the trunk. 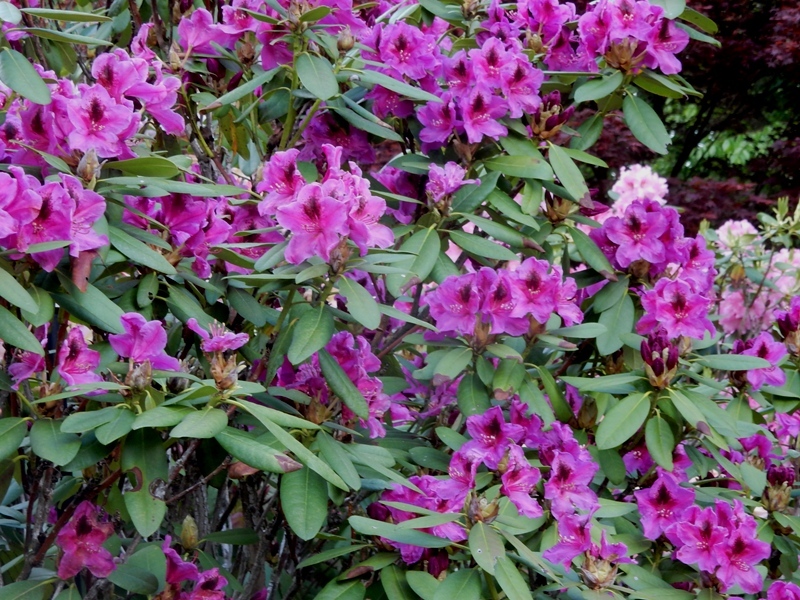 For wonderful information about rhodies, including the best performers in your region check out the American Rhododendron Society’s website. 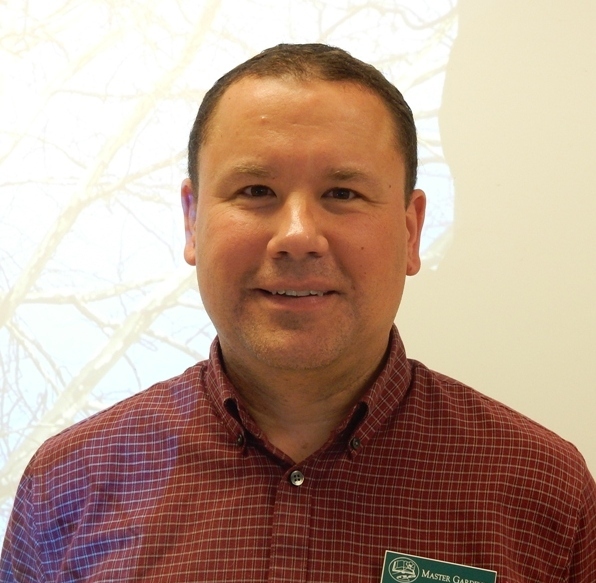 Jay Vinskey gave a useful workshop on Underutilized Trees and Shrubs at the WMMGA Spring Garden Symposium last weekend. 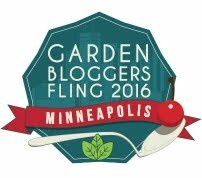 I attended because I may not be quite finished choosing shrubs for our new Greenfield garden and I was looking for more suggestions. 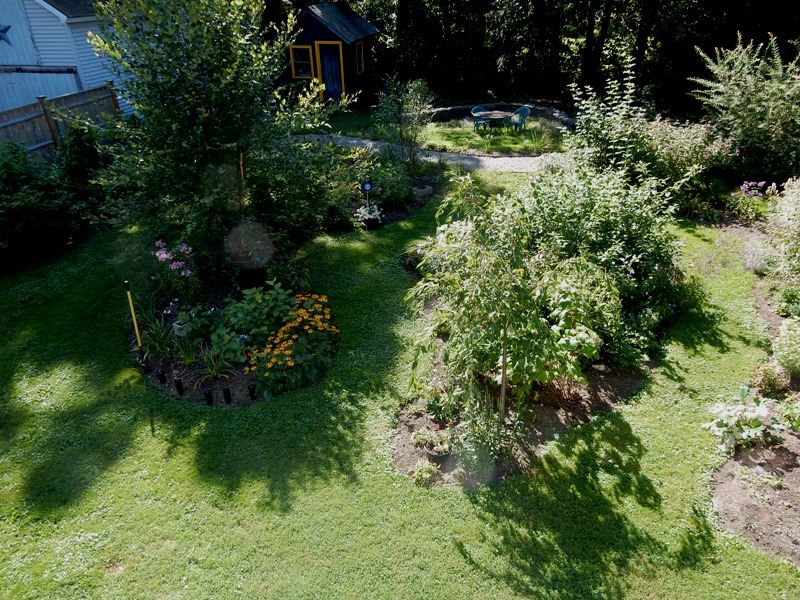 Small trees and shrubs are the elements I am counting on to make this a sustainable, low maintenance garden. Vinskey’s list included trees like paperbark maple, tupelo, ironwood, redbud, stewartia, and pagoda dogwood. His shrub list included beautyberry, Carolina allspice, fringe tree, witch hazel, and redvein enkianthus. Vinskey chose these because of their fine attributes of bark, blossom and autumn color or winter interest. Happily for me I had already planted some of his suggestions. It is important to know that Vinskey chose plants that were hardy in our region. The USDA lists Greenfield as zone 5b which means plants will survive winter temperatures as low as -15 to -10. Nowadays I have to wonder whether we might actually be in zone 6a which is -10 to -5 and I would be willing to take a gamble on a slightly more tender plant like stewartia. It is also important to know how much shade or sun a plant needs to thrive. However, I also have to take into account that my garden is very wet at least during late winter and early spring, even when we are having a drought. While listening to Vinskey I was happy that I had already planted pagoda dogwood and Carolina allspice in my garden. The pagoda dogwood is a small tree with a very horizontal arrangement of branches. The flowers are small and not particularly notable, but the sculptural shape of the tree is the delight. I saw a beautiful specimen in Minneapolis last summer; the tree’s gardener told me it did require some regular pruning to keep that clean shape at its best. Calycanthus or Carolina allspice is a shrub that can take a fair amount of shade and produces dramatic dark red blossoms from May into July. And, of course, there is the sweet fragrance. In addition I’ve planted buttonbush, elderberry, spicebush and winterberry shrubs, which I personally think of as underutilized. Perhaps some gardeners would consider them too wild for a cultivated garden. My perennial list includes joe pye weed, boneset, culver’s root, Echinacea, American burnet, turtlehead, bee balm, Siberian irises Japanese primroses, and bog rosemary which is a water tolerant ground cover. You can see that in a sense I have been cultivating a wetland garden. These plants don’t need to be in wet ground all the time, but they thrive when the soil is moist, or water is puddling around their feet. Some are familiar to flower gardeners, but others are more unusual although those who love native flowers may find them familiar. The fact that I have so many native plants in my garden is because I wanted plants attractive to bees and other pollinators including butterflies. Having a pollinator garden is one of my goals. Because honeybees and other pollinators are under so much attack by the use, and often overuse, of herbicides and pesticides I want to play my part in supporting these vital creatures. Without pollinators many of our vegetables and fruits would no longer exist. This year there will be a special opportunity and event at the Langstroth Bee Festival on Saturday, June 3. The Second Congregational Church, which this year is celebrating its 200th anniversary, has cooperated with the Franklin County Beekeepers Association for several years creating a bee festival that will entertain and educate children, and all the rest of us too, about honey bees and the 300 odd other native bees that work hard to make sure we have good vegetables and fruits to eat. 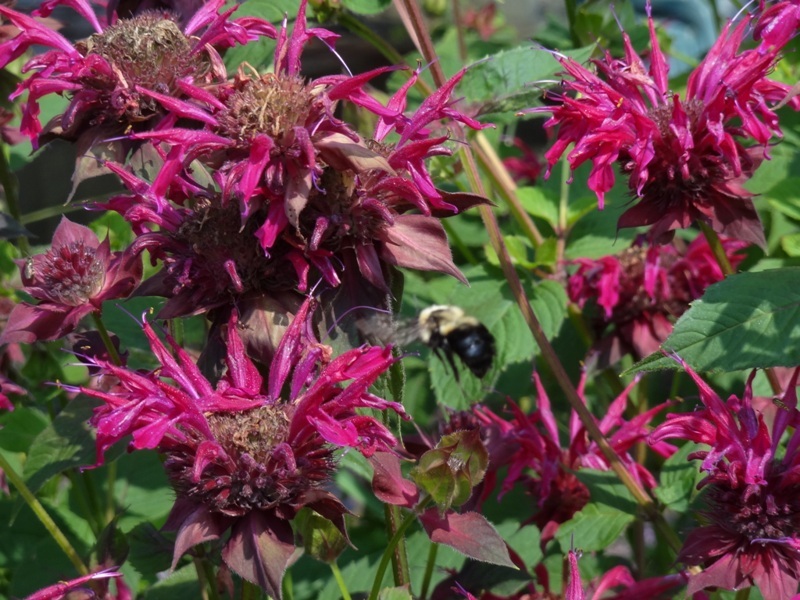 Greenfield has a very special connection to honeybees because the Reverend Lorenzo Langstroth served as the Second Congregational Church’s minister from 1840-1848. He is one of the people who recognized ‘bee space’, the specific distance that honeybees leave between their honeycombs so that they could fill, or empty them. He also invented the modern wooden beehive that allows for ‘bee space’ between the removable frames. This year, in honor of the church’s anniversary, special celebratory events are scheduled for the Bee Festival. Kim Flottam, editor in chief of Bee Culture Magazine and author of several books on beekeeping, will be the main speaker. Those who are interested in this award should fill out an application. Requirements are that the garden be in Franklin County, and that no pesticides or herbicides can be used anywhere on the property. For more information check out the Bee Spaces pages on Facebook, Pinterest and Instagram. This is the kick off of the award, so if you think your garden might need a little updating to be eligible remember that there is always next year, and the Second Annual Bee Spaces Award. Theoretically spring has sprung. The first day of spring dawned chilly, but temperatures got to 56 degrees before they began to fall again. I thought wistfully of this time of the year in 2016. 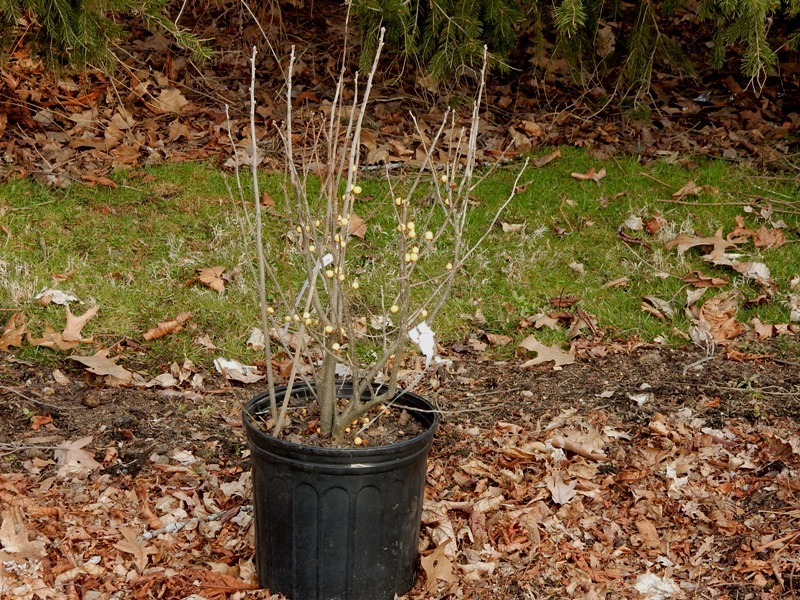 Last year I went shopping and bought potted shrubs which I planted on March 22, along with a Lindera benzoin, spicebush. Spicebush swallowtail butterflies like to eat the foliage of Lindera Benzoin. I had a wonderful day last year working in the garden, cleaning up and planting. And then . . .
the sun set and snow fell. Oh, well. Real spring will come. I guess Spring has to be sprung several times before it feels at home. Recently a friend asked if I had any suggestions for creating a sound barrier in front of his house. My first idea was arborvitae. These neat symmetrical conifers are popular because they are not only handsome, but because they are low maintenance plants. They are hardy, not fussy about soil, are fairly salt tolerant and once they are established they are drought tolerant. They also tolerate some shade but need at least four hours of sun. 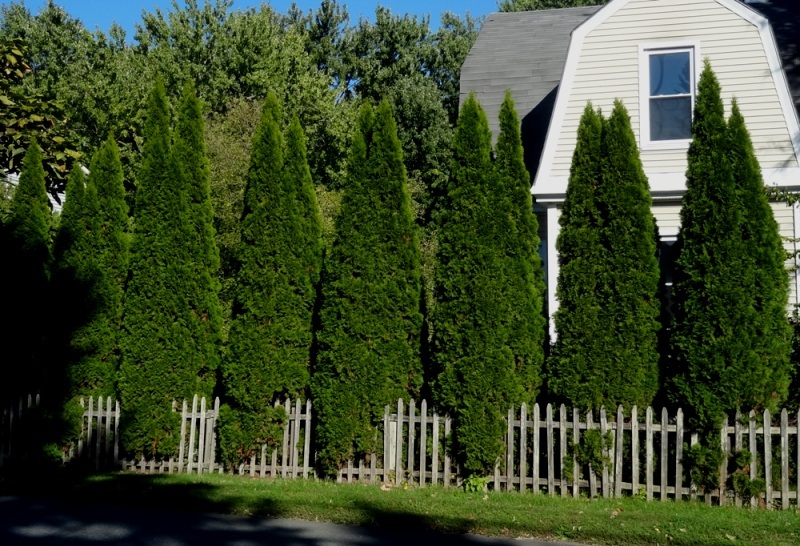 Two easily available arborvitae cultivars are Emerald Green which will reach a height of about 15 feet with a three to four foot spread, growing at a rate of about a foot a year. Green Giant will reach a height of 30-40 feet with a 15-20 foot spread, and grows more rapidly. The Leyland cedar, which has the scale-like foliage and other attributes similar to that of the arborvitae, will grow about two feet a year until it is 60 feet or more with a spread of about 20 feet. It needs full sun. The question with any planting is how long it will take before the plants achieve your goal. One way to hurry the usefulness of a sound barrier created by these trees is to plant two rows, with the second row planted off center. Two rows planted this way will give you a solid barrier more quickly. An annual pruning will help control the height. Evergreens make the best sound barrier, but people need other barriers if they are looking for greater privacy on small urban lots. I have seen houses here in Greenfield that have five or six foot privet hedges in front of their houses to give them privacy in their gardens. The lots on our Greenfield street are quite narrow. Houses take up most of the width of the lot and driveways use more land next to the house. The north side of our house, where we park our car, is hardly more than an alley. Long ago our neighbor on that side planted a privet hedge which is now about seven or eight feet tall. On the south side there is approximately 21 feet from our house to our neighbor’s driveway. Driveways are necessary and we all have them, but no one ever claimed they were things of beauty. Our answer was a deep border filled with blooming shrubs. I began with hydrangeas which have become so popular. There are different families of hydrangea and each of them has different requirements and benefits. I was careful to choose paniculata hydrangeas which have the kind of loose, airy flower clusters that I like. I am not as fond of the familiar snowball hydrangeas. Paniculata hydrangeas are hardy and not very fussy. All three of the cultivars I chose should be pruned back slightly in the very early spring to encourage new growth, but they require little other care. I chose three which promise to be tall and wide. 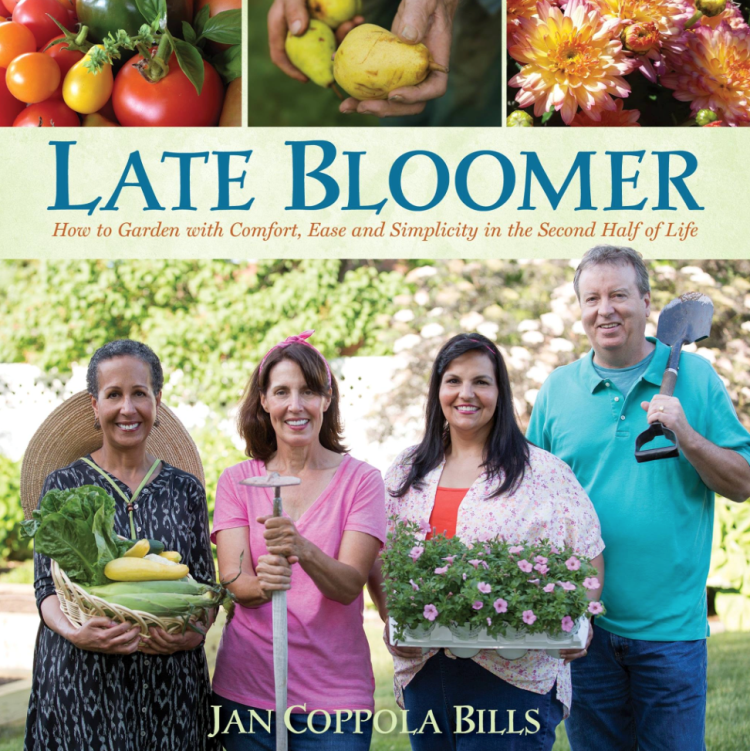 Limelight has a long bloom season, producing large pale green flowers from mid-summer into the fall. Hydrangeas grow quickly and it should not take long before my Limelight reaches a height of at least five feet, and I’m hoping for seven or eight feet, with an equal spread. Then I chose Angel’s Blush hydrangea because its label said it was one of the largest hydrangeas and would grow to 10 feet tall and just as wide. The large loose flower clusters turn a lovely shade of pink over the summer. It also tolerates some shade. Since I can never resist shades of pink and red my third choice was Quick Fire. The large flowers will turn a deeper and deeper shade of pink/red over the summer. It will reach a similar height and width as Angel’s Blush. 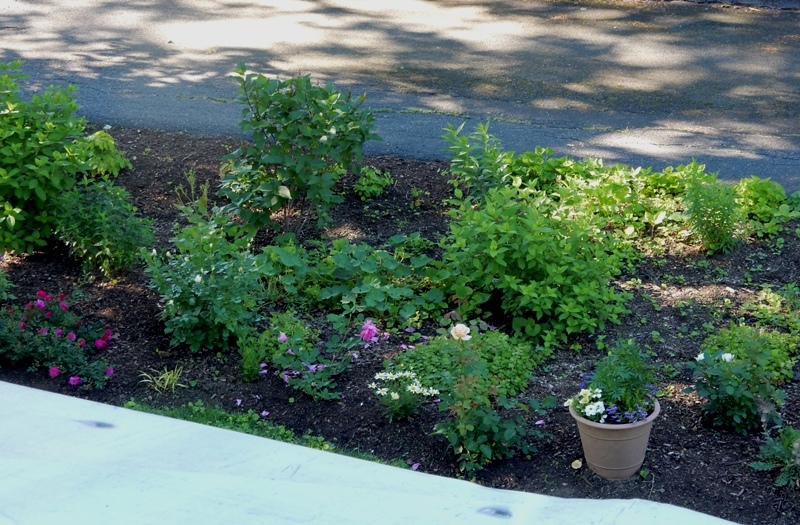 I’ve planted lilacs and viburnams in this deep border as well, but hydrangeas will be the stars. Because these shrubs are still young, I have also used ground covers, perennials and a few annuals to cover the ground. I’d don’t want to look at bare soil any more than I do a driveway. As the shrubs fill out I will move those plants to a roomier spot. My photo of a section of this border/barrier looks a bit of a tangle, but that will change as the hydrangeas mature. No matter how big and tall my hydrangeas get they will loose their blossoms and foliage when frigid winter storms in, but we will be keeping our heads down and rushing from car to house so we won’t be looking at the flower bed. Or my neighbor’s driveway. We are also planning a privacy barrier with a third type of shrub at the back of our lot. The very back border is a bit of a tangle of weedy trees and Virginia creeper. I don’t object to this wildness because wild space is important to support pollinators and birds. However, it is not lovely. Because this end of our lot is very wet we have created a kind of large raised bed that we call The Hugel. So far we have only planted groundcovers on The Hugel, but in the spring we will plant beautiful broadleaf evergreens, rhododendrons. Do you have a favorite chair? Is it near a window? Does your dining table sit near a window? Do you enjoy the view from your window? Oddly, our new house in Greenfield does not have many windows that look out at the garden. 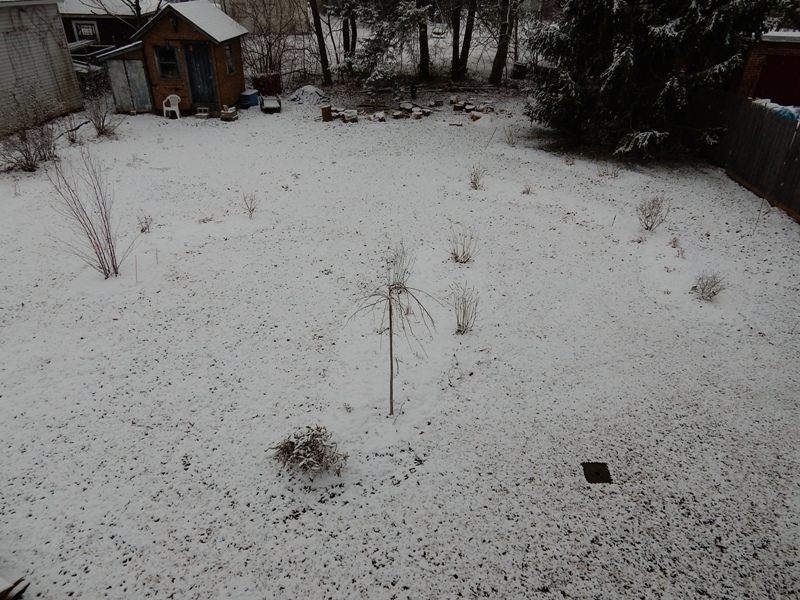 Only one upstairs window (in my office) gives a view of the back yard. The kitchen window is too high to see much of anything except the most westerly area of the garden. Fortunately there is the dining room window which looks out onto a section of the South Border, which will ultimately be the most floriferous view. Last week my husband and I were having dinner and admiring the view of newly blooming roses, I was so happy to have this joyful view. Then I realized that the view from a window is not usually a part of garden planning or design. Yet a view that will please, whether flowery or serene green, can give us hours of pleasure. I am looking forward to enjoying a better view of my garden. We are about to embark on a kitchen renovation which will not only give me a kitchen where I can cook and bake more easily and efficiently, it will also give me new windows that will allow a fuller view of the garden. The windows will also help define and frame an area I might want to concentrate on as I plan new plantings. They will give me another chance to create a beautiful view from inside the house. When planning a vignette, a limited view of a small space, you have the advantage that accrues to a small space. You can plant something special that might be quite expensive, but can also be the star of this relatively small space. I’m already thinking about an intersectional peony like Bartzella. Intersectional or Itoh peonies are hybrids of herbaceous and tree peonies. An Itoh peony would be ideal because it would have strong stems that keep the flower heads high and don’t get beaten down in the rain like herbaceous peonies. In addition, because of because its primary and secondary buds, it has a long bloom season. If flowers are what you long for, but no longer feel up to a whole garden full of demanding flowers, it is still possible to create a flowery view. You might consider an annual bed. Just a few flats of starts will give you a riot of color. I can imagine tall annuals with gentle colors like sweet peas, cleome or cosmos or the brilliant colors of zinnias. These can be fronted with low growing annuals in companionable colors like blue Felicia daisies, pale marguerite daisies, osteospurmums (another daisy-like plant) in shades of pink, purple, blue or white, and salvias. An annual bed might also be an experimental bed, an opportunity to try out different flowers, colors and flower forms. 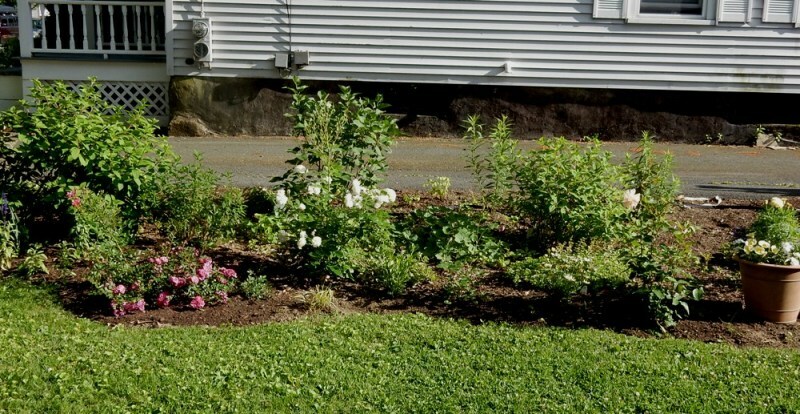 Starting this kind of bed will not be costly, and will not chain you to a choice, because all the frost-bitten plants will end up in the compost pile at season’s end. Just remember this is an experiment so be sure to keep a few notes so you can repeat the flowers you like next year. A different way to have flowers in your view is to plan a perennial selection that will give you one or two flowers for each season. For example you could begin with daffodils, then have astilbe, achillea and daylilies. Dahlias have a long season of bloom, especially if you keep cutting them for bouquets. The more you cut, the longer the season and the greater the bloom. Some smaller dahlias will begin blooming in midsummer but you can have dahlias with all their shades of color and form until the first heavy frost. One autumnal choice that surprised me was the Japanese anemone that blooms into the fall. And of course, there are asters and mums, which also have many colors and flower forms. You could plant for the birds. Perhaps you could have a small tree like a dwarf crabapple near the window along with a bird feeder and a birdbath. An expert birdwatcher once told me that the sound of water is the best way of attracting birds. The tree branches and foliage would give the birds protection and shelter if they became alarmed. My eyesight is such that I really need to be able to get pretty close to birds if I am going to learn to identify them. In my new garden I am concentrating on having more green than color. Green is not a single color and a green view could include bright shades like golden threadleaf chamaesyparis contrasting with dark green mugo pine. Perennials like hostas are available in dozens of shades of green from brilliant chartreuse to dark green, to blue-green. Variegated hostas will also provide a symphony of greens brightened with shades of white. Another view could be a piece of art set against shrubs and flowers. 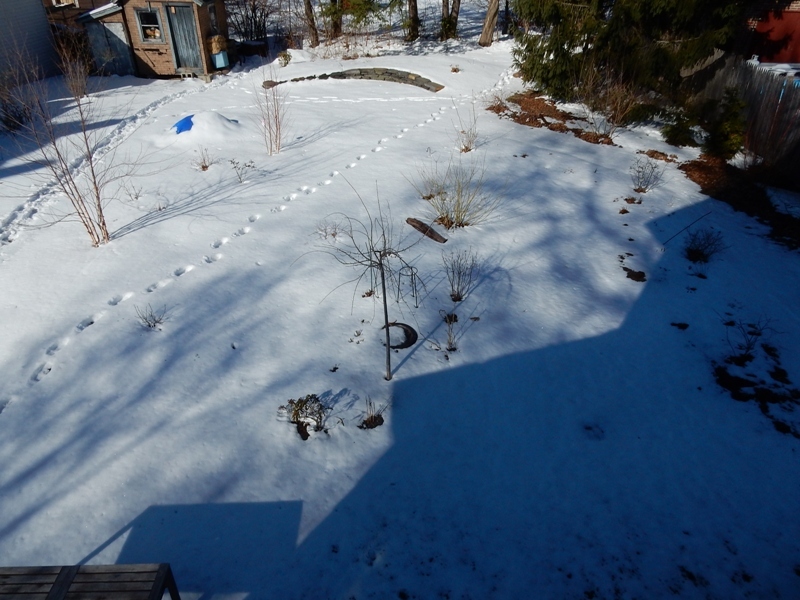 I’ve never managed this, but I did get to the point in Heath where I demanded neatness of the view of the backyard. Wheelbarrows, lawn mowers, buckets of weeds, all were forbidden to mar the view of pink, white and green kiwi foliage rambling high on the shed wall above the roses. Serenity was what I wanted with my first cup of coffee in the morning. So, what view do you have that pleases you? Flowers? Greenery? Statuary? What view would you like to have? When will you get it? If not now, when?